Have you been considering eloping? We have calls often asking us what you have to do to elope in Texas. So, I laid out the 10 steps to make it easy as possible. Next, you need to propose or have them propose to you. They may take a while and really this is not something you want to rush into. There are some great ideas out there on making the Proposal a really special and memorable one to remember. That is one reason the State of Texas has the 72 hour law. We will discuss that later. Search for the perfect destination for your wedding. You can go to a Justice of the Peace at the local court house, but let’s face it, that is about as unromantic as it can get. And believe me most of them want to rush through it fast and just get paid. So your choice of location for you wedding is something to spend time doing research on. We offer some beautiful locations on our property for your special day. Getting your marriage license. The State of Texas requires that the marriage license be gotten 72 hours before the actual ceremony and up to 90 days before. I think they did this to keep the “bar hoppers” from getting drunk and asking some cutie to marry them right then. Just my thoughts. You can get your license from your county and then it can be used in any county in Texas. The only exception to this rule is for active military, then the 72 hour law is waved. Oh now the fun part. Shopping for a wedding outfit and attire. We have girls elope here that wear everything from full blown wedding dresses with long veils to boots and jeans. We have had Steam Punk weddings, Celtic weddings and Camo weddings. Be yourself, but keep it simple. We love how couples express themselves. Flowers, cakes and photos, Oh My! You will only need a small wedding cake if you do the elopement ceremony. So, see if your destination provides that for you. Photos, now that is where I think you really need to spend the money, because after the wedding is over, all you have left are the wedding photos to remember. I have been married for 37 years and my granddaughters love to look at our photos. Your flowers can be simple or elaborate. It’s your choice. I like a more simple bouquet for elopements since you don’t usually have someone there to hold them for you. Our package includes, the ceremony, cake, flowers and photos. Honeymoon! Oh, now this is a fun thing to plan. You may be doing an all inclusive destination that offers your honeymoon lodging also. If not, then be sure you have time to plan on getting from your ceremony to the honeymoon location with out having to drive for hours after the ceremony. I made that mistake, not fun. Arrive at your destination. Hopefully, you have either viewed the location online or gone and visited the place and talked with the owners as to what is to be expected by you and them. Some will offer several different locations for you to choose your special spot for the ceremony and may offer different packages. We offer several options for you to choose from. The “I Do’s”. You have all the the other top things down, and now the time for the butterflies and giggles. Hopefully, your day will go easy and the weather will be just perfect for you and your love to have your wedding. I will say, that it may not always go perfect, but in the end, it will be ok and you will still be married. And may I add here, that we love to see emotions, that just makes us feel like the couple is very serious about each other. Believe me, Mr. Don & I have shed a many a tear with couples at times. Last, it’s having the officiant sign the marriage license and making you officially married. You do not have to have witnesses any longer and you all do not have to sign the license either. So there we have it, 10 easy and fun steps to elope in Texas. We here at Star of Texas Bed & Breakfast do our best to make your day as special and stress free as possible. We do everything in house or have local professionals that we trust and work with also. 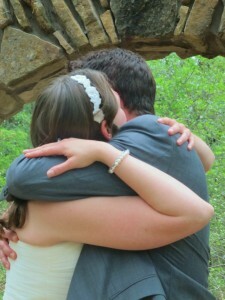 Please view our Elopement and Intimate Wedding packages. Get in touch if you have any questions or would like to set an appointment to view and discuss your elopement with us. This entry was posted in Intimate Texas Weddings, Packages, Texas Elopements, Texas honeymoons, Texas Weddings and tagged b&b elopements, elope in Texas, elopement packages, Texas hill country bed & breakfast by admin. Bookmark the permalink.